This morning as I drove to the gym, I was listening to a radio DJ express how astounding it was to him that Robin Williams, a man who was so beloved, so successful, so loaded with talent, who had a genius that made millions upon millions of people laugh, could, underneath all of that, have dealt with a depression so powerful that it caused him to take his own life. I can understand how people would be baffled by that seeming incongruity. But this is the truth of depression: that it digs deep and it divides the soul and that in the depths of this divide is where it casts it shadows. Depression isn’t unhappiness. And it is more than the kind of unhappiness that comes and goes without a definable cause, which is how so many people perceive depression. In the midst of depression, you can experience laughter, happiness and even true, overwhelming joy. You can be cheerful and outgoing and funny and charming. But in depression, you learn to be wary of the good feelings, because they never come alone. In depression, a shadow self, one that is in you, of you, always around you, convinces you that in this great, wide, terrible, wonderful world, you’re really nothing. There are so many other people, everywhere, who are so much more valuable than you are. And although you know that you have worth in the eyes of the people who love you, you also know that really, you, in your essence, are worthless. And in your worthlessness, the things that should make you happy — even the fact that they do make you happy — make you suffer because you don’t deserve them. You don’t deserve happiness or success or any of the good things that come your way. And when your successes bring you praise or accolades, you feel pride and exhilaration and a crushing conviction that you are a fraud. And after awhile, when there is nothing on the surface of your life that isn’t shadowed by the ingrown knowledge that you are a worthless, undeserving fraud, you start to feel despair, or you start to feel nothing, but whatever it is that you feel, you have little hope that it will ever change. And for some of us, a lifetime of despair, or a lifetime of nothingness, or a lifetime of vaulting between the two extremes without hope of escape becomes too much. It just becomes too much. I’ve dealt with anxiety and depression for as long as I can remember. I am adopted, but the one thing I know about my paternal heritage is that depression and addiction run powerfully through that side of my family of origin. And I can already see signs of depression sprouting in my six-year-old daughter. I’m familiar with what depression can do to a person. Depression is a lifelong companion. It can be a burden, but it can also be a gift. It forces you to be introspective, which is where creativity often is born. It also inspires you to be kind, because you know how precious and painful life can be. Depression is also treatable. It can kill, but it doesn’t have to. The important thing to remember is that depression hides, and it hides itself well. It’s a whirlpool under a placid surface. You encounter it often, but you rarely see it. So be kind. Be tender. Remember that there are people to whom life seems meaningless, but who choose, every single day, to keep living because they know they have to — and because there is still a flicker of hope that lights their darkness. You can’t cure depression in someone else — but you could be the one who helps to keep that flame alive, so that person chooses another day. 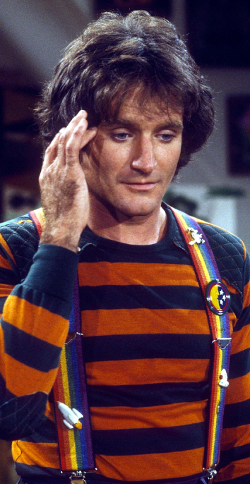 Nanu Nanu, Mork. You lit up our lives with laughter. For a funny and heartbreaking take on depression (because depressed people are actually pretty hilarious), visit Allie Brosh at Hyperbole and a Half and read her comics, Adventures in Depression and Depression, Part Two. For resources on how to help yourself deal with depression, visit Jenny Lawson, The Bloggess, who is another awesomely funny writer who also suffers from chronic depression. And, of course, NAMI has an exhaustive list of resources for people with depression and those of us who love people with depression.